^ a b 柳田卓爾 2008, p. 28. ^ 柳田卓爾 2008, p. 32. ^ a b 柳田卓爾 2008, p. 32‐34. ^ 柳田卓爾 2008, p. 34. ^ 柳田卓爾 2008, p. 36. ^ 柳田卓爾 2008, p. 39-40. ^ 柳田卓爾 2008, p. 58. ^  Archived April 7, 2005, at the Wayback Machine. ^ Kamiya, Setsuko, "Suds on tap for summer thirsts", The Japan Times, 7 August 2007, p. 2. ^ 鈴木義男. “法廷に現れたる統制違反”. 法律時報 (日本評論社) 16巻3号 (1944年3月). 柳田卓爾 (2008) (PDF). 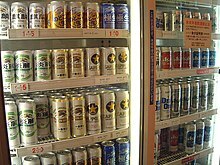 戦前の日本ビール産業の概観. 57 ( 4 ). 山口大學經濟學會. pp. 27-63. http://jairo.nii.ac.jp/0022/00016216.